Acclaimed New York artist, Naomi Boyd, and music therapist, Keith Wilson, loved one another five years ago, until her grandfather separated them. That root of bitterness keeps them apart until a letter from Keith’s grandmother, Ruth, draws Naomi to Londonderry to find she’s too late. Ruth has passed on. After the death of his beloved grandmother, Keith has also come to Londonderry only to open the door to his past . . .Naomi...beautiful as ever, the girl who broke his heart. A mysterious painting in Ruth’s attic brings up questions about their grandparents’ entwined past and their own broken romance. More comfortable with the unspoken languages of art and music, Naomi and Keith find it difficult to share their old hurts and true feelings. Keith couldn’t get the old song about marrying a girl like the one Dad married out of his head as he dusted the heavy pewter frame of his grandparents’ wedding photo. His granda used to sing that song all the time. Keith held the picture up to catch Londonderry’s wintry light streaming through the parlor window, his gaze moving from his grandfather’s face to his grandmother’s. A girl just like... He cleared the roughness from his voice. Actually, someone like the girl that married his grandfather was more in keeping with what he was praying for in a wife. Yeah, his sweet Irish Gran, no woman could even come close to the gal she used to be. The way she used to bang the piano keys when the family this side of the ocean had a good old knees up party with plenty of singing and dancing. But her laughing eyes could turn to scolding as quick as a storm coming off the Irish Sea. And then those eyes melted within moments afterward with a hug, and most likely a chocolate biscuit. Dear Lord, I’m going to miss her and that wild sense of humor she had, not to mention her cooking. The doorbell rang. Were his cousins back already with more boxes? Garrick and Sandra had left only twenty minutes ago, but they needed a load more containers if he was to ever get started on emptying this house. What a royal mess he and his Irish cousins had made of the first floor of this small, red-brick row house. He’d only just started, but there were two floors, and then the attic. Thanks, Gran, for asking me to take care of this for you—me of all people. Now if all this stuff was musical gear he’d know what to do, but what was he to do with his grandmother’s dainty things? She’d been so insistent though, and he could never refuse her anything. She also knew he’d take any opportunity to fly over to Ireland. Yes, Gran, I’m on my way. Garrick and Sandra must have forgotten their key. Stretching his baritone voice into the comical, falsetto tenor that he put on for his senior clients, Keith belted out the song on his way through the hall to the front door. He grabbed hold of the doorknob, amazed that even this farcical singing somehow eased his grief. But then, it was something Gran would have done to entertain the family. Throwing the door wide with flourish, he slapped a hand on his chest and reached for the crescendo. His voice petered out as his gaze landed on the woman standing on the stoop. The joke was on him. Set against a backdrop of falling snow, a pair of startled gray-green eyes came level with his mouth. She was lovely. Not beautiful in that cold, glossy, magazine look that bombarded a guy’s eyes at the supermarket checkout, just...lovely. Like a dolt, he couldn’t think of any other word to describe her. Only the sentimental phrase of another old song came into his mind. The one about being like a dream. So lovely. Her blonde hair, cut to curve the line of her jaw, swung forward to touch her chin. It was almost hidden by a thick white scarf and the collar of a buttoned-up wool coat, ruby red. He remembered it was her favorite color. Snow fell over her in a drape of soft flakes, and all he could think was that above that scarf was the most kissable set of lips in the world. He knew, because he’d kissed those lips every chance he’d got. He could have spent the rest of his life kissing this one woman, if she hadn’t so unceremoniously dumped him. After she’d been gaping at him only seconds before, she snapped her mouth shut. Evidently, she was no more pleased to see him than he was to see her. Of all the girls to land on this doorstep. “Naomi?” He croaked, disgusted that his voice should crack at a time like this. What was he—thirty, or thirteen? While his vocal chords weren’t sure how old he was, he knew this—she was definitely not the girl he’d been singing about. Somehow since he’d arrived on Irish soil a week ago for his grandmother’s funeral, he’d slipped into the local brogue. In his thoughts, the words rolled with a Northern Irish rhythm, Naomi Doyle, you’re far from the saint my grandmother was, even though your eyes at this moment hold that same storm-tossed look of the sea. Naomi looked away from the door and down the brick-paved street. Keith Wilson? Keith? Why on earth was he here? Yes, this was his grandmother’s house, but he should be at home in the States. Not here, glaring down at her, no doubt wondering why she was not at home in New York. To gather her myriad emotions that were galloping off in all directions, she kept her gaze trained on the distance. From here she could almost see the River Foyle and the low-lying mountains beyond. Dusted with snow, the boggy heights resembled the plum puddings her grandfather used to make with a thick coating of icing sugar sprinkled on top. The memory only made her miss Gramps, but it corralled her emotions into some semblance of order. Ruth’s letter was in her purse, confirming she had every right to come here, though she’d not taken Ruth up on the offer to stay at her place. But the house and street looked the same, even if a great deal had changed since the last time she’d visited. Keith looked the same, too. Dear Father God, he looks the same—still the slender frame of a musician, not bulky muscle, but all fluid strength in jeans and a lightweight gray turtleneck, all six feet of him. A faint flush tainted his Black Irish looks—that combination of the blue-black hair of the Spanish, but instead of brown eyes, eyes the piercing color of the sky. Too gorgeous for her peace of mind, right now. His black hair was shorter than it used to be, almost conservative with a hint of his artistic soul in the slightly overlong sweep falling across his forehead. She’d heard that he’d become a music therapist. But maybe he was still into the concert scene like he’d been during his university days in Belfast, and she’d been painting the Irish coastline. Not that it mattered anymore. What they had in the past was over. It was stupid to remember, really. So why was it that she did remember? Everything. “Hi, Keith. I’ve come at the invitation of your grandmother.” She shivered with the wind keening from the north and swirling around her legs encased in black dress pants. Yes, it was January, but who’d have thought so-called soft Ireland would be this cold? And why, Dear Lord, why does Keith have to be here? She caught the trace of an Irish accent as she stepped into the house. He was like her in that respect. As American children of Irish immigrants living in the States, they both could slip into the lingo as soon as they touched foot on the blessed Emerald Isle. 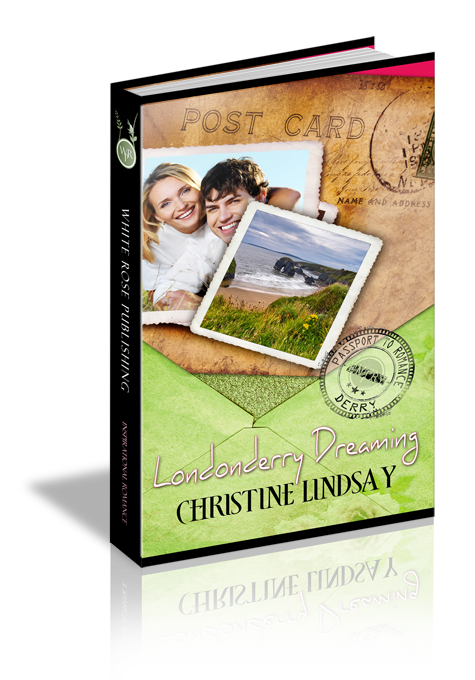 But then, that’s what had drawn her and Keith together in the first place, their Irish connection, and that both of their families came from Londonderry. Conscious of Keith’s close proximity she stopped at the bottom of a slim, steep staircase, and he led her at a sharp right into the parlor. Towards the back, lay a tiny kitchenette, what Ruth called the scullery. In the parlor, a small electric fireplace took precedence on the wall opposite, surrounded by sofas set at comfortable angles and tables filled with English china and Irish porcelain. The whole room, while humble, had an air of elegance just like his Grandmother Ruth. That was, if it wasn’t for the half-filled boxes, piles of paraphernalia, and faded rectangles on the wall-papered walls where pictures had recently hung. Only the upright piano next to the scullery door looked the same. Keith moved a box from a chair and sat down, peering at her. As if it was five years ago, he absentmindedly stroked his chin that held a day’s shadow of beard, and which her fingers, traitors that they were, longed to touch. Something else to ignore, if she could. She and Keith had not parted well, but the tenderness in his eyes urged her on, just like it had done when they first met that autumn in Belfast. “Your gran—Ruth—said in her letter that she had something she wanted to tell me about my grandfather. And something she wanted me to have.” She kept to herself the belief that what Ruth wanted to tell her would make sense of a lot of things. But Keith’s reaction to her breaking up with him, all that time ago, still rang in her ears. It was best to keep him on a need-to-know basis. Only a month after Gramps died. Outside, the snow still fell, obliterating her view of the houses across the street, obliterating her view of so much, the past she wanted answers to. “Ruth is gone?” The letter she held in her gloved hands crackled. “Keith, I don’t know what to say. I’m so sorry. You’ll miss her terribly.” Through blurred vision, she dropped her gaze to the lines from Ruth that had called her across the Atlantic. Only a month ago she’d laid Gramps to rest, and she’d been looking forward to seeing Ruth. Looking forward—what an understatement! There were no other relatives for her to claim. She’d been hungry to lean on Ruth as a family friend, hanging onto those words, You’ve always been like a granddaughter to me. He left her then, and she could hear him working in the small scullery while she wiped an impatient hand across her cheeks. Ruth wouldn’t want her to cry for long. Besides, like Keith said, Ruth was in Heaven now, and she’d see her again one day. Instead, she stood to touch some of the Irish porcelain and marveled at its almost see-through delicacy. She studied a few landscapes on the wall, not professional by any means, those of a talented amateur and signed by Bob Wilson, Ruth’s husband. But the room was already empty of the essence that used to be Ruth. There was more of that dear, elderly woman in the letter, and she sat down to read it again. She’d always liked Ruth and never could understand her grandfather’s long-held dislike of the woman. If only she’d stood up to Gramps earlier. Said how she felt about Ruth…about Keith… And now it was too late. She smiled to hear one of Ruth’s phrases flow so freely off his tongue. “So that’s why you’re here, for the funeral,” she said as he helped her out of her coat. “And I’m staying on to clear out the house. Most of the family has already taken the items important to them, and my two cousins are going to help with the rest. The others will pop in when needed. There’s tons of stuff in closets and crannies that I need to dispose of or pass on. It’s not just my grandparents’ lives represented here, but that of their kids. Not to mention the grandchildren and great-grandchildren that used to come in and out of this house. There are enough of us to populate a small country.” A grin spread over his face from the memories. “Are your parents here, too?” She sat on the sofa, trying not to let that grin of his send her emotions on another wild gallop. “We laid Gran to rest a week ago, and Mom and Dad have gone home already. Dad can’t leave the hardware store too long. Mom is still teaching. And strangely, it was me that Gran asked to clear out her stuff.” He poured milk into a cup first, and then followed with hot tea, Irish style. “She was most particular in a letter left with her lawyer as to how she wanted the job done. So I took some time from my practice, leaving my business partner in charge.” He handed her the cup. “And your grandfather Bobs?” She ignored the little shiver of delight running down her spine that he’d remembered how she took her tea. The picture was of Ruth and Bob Wilson, both of them in uniforms of the Second World War, she an ambulance driver, and Bob in the same regalia Gramps had worn. But then, both men had served in the same paratroop division. Both had been shot down over Holland. Keith resumed his seat and took up his own cup, stirring in a teaspoon of sugar. “A lot of memories in this old house.” She heard the wistful note in her voice. Unlike him, she didn’t have a load of cousins to share the grief of losing a grandparent. That’s what came of a set of grandparents who had only one son, and that one son having only one daughter. But Gramps had made up for all shortages of family in her life. She’d been everything to him. And he’d tried to be everything to her. Keith set his teacup on a table, a ghost of a chuckle emanating from him. “Yeah, there are a lot of good memories here. No money, but lots of love.” But as he caught her eye, his face flushed a dull red. The silence landed with an almost audible thud. What warmth she had been feeling shut off, and she felt as though she was suddenly outside again on the stoop in the cold wind. She longed to explain, get it out in the open, tell him now that it had never been about money, or his family’s lack of money, that had caused their breakup. At least not for her. Gramps had been another story, though. But the words stuck in her throat. Two deep frown lines pulled his brows together, and his mouth flattened as he glanced away. Without him saying a word, she knew he still held her rejection of him against her. They never used to have trouble talking. From the first day they’d met at Queens University they’d chatted the afternoon away into the evening. She’d been attending a series of lectures that week as a guest while he was a full-time student. By the end of the week he’d kissed her for the first time. A sweet little kiss. Just on the cheek...not like the kisses he’d given her the months following. Her mind did a sharp U-turn from those memories. There was no sense going down that painful road again. But Keith leaned forward, resting his elbows on his lap, dangling those long, sensitive hands between his knees, hands that stroked a guitar so that the instrument veritably sang. Those fingers used to brush her cheek, turning her face gently to his for a kiss. But she mustn’t remember those moments. Still, her gaze searched out the fact that he wore no wedding ring. So he wasn’t married. Surely after all this time he had a steady girlfriend, a fiancée? A man as good looking as him and as talented, wouldn’t lack for female companionship. His question made her jump. In her mind’s eye she’d been doing what she always did—mentally drawing whatever it saw. And how she had drawn his face over and over and over in her thoughts that first year after she’d left Northern Ireland and gone home to New York to start her formal art course. “But your grandfather left Ireland after the war ended. What could it possibly be? I haven’t really looked into all the rooms, only a cursory glance, but so far I haven’t seen anything with your name on it, or his.” His gaze roamed her features. The warmth in her face flickered down to her toes. His tone had changed, coming across like warm caramel, and brought a soft response from her. “There’s no rush for me to return home. Like you, I’ve taken some time off from my work. My gallery’s in good hands with my manager, so I plan on staying in Ireland for…for as long as I feel like it.” The last bit ended in a rush. The idea of spending time putting Ruth’s house in order appealed. She could say goodbye to Ruth...and her own Gramps at the same time. But that wasn’t all. Far from it. She jutted her chin out, smiling to soften the gesture. She and Keith could never go back to what they’d been before, but she could do this one thing. She couldn’t say the words out loud, but they reverberated in her mind. For old time’s sake, for what we used to be to each other. To make up for hurting you. Question 1: The Ruth and Naomi of Londonderry have a similar relationship to that of the biblical Ruth and Naomi. What emotional need in the biblical Naomi did Ruth fill? Answer 1: Ruth 1:14-16 Ruth loved Naomi as a mother, and because of that she wanted to love and obey Naomi's God. Question 2: In Chapter 2 Keith mentions the senior citizens he works with, and their loss of love. For many people this could mean the death of a beloved spouse. In Keith's mind he's thinking of his own loss--that of Naomi. How did the loss of love affect the biblical Ruth and Naomi? Answer 2: Ruth 1:20, 21 “Don’t call me Naomi,” she told the (women in Bethlehem). “Call me Mara,because the Almighty has made my life very bitter. I went away full, but the Lord has brought me back empty. Why call me Naomi? The Lord has afflicted me; the Almighty has brought misfortune upon me.” The loss of husbands and sons is not only a great emotional loss but an economical one for these women. Question 3: In chapter 3 the Londonderry Naomi visits the church that Keith's grandmother used to attend. What is it about this church that reminds her of Keith's grandmother? Answer 3: The church's simple lines and lack of grandeur remind Naomi of Ruth's humble nature, and that of the Lord Jesus Christ. Question 4: What forms of expression are Keith and Naomi most comfortable with? Answer 4: Naomi expresses her deepest thoughts through the medium of painting, and Keith speaks through music. Question 5: Does God speak through the unspoken languages? Answer 5: Yes, God speaks to us through His creation, music, art, song, touch. We just need to open ourselves up to his love that is all around us. Question 6: Ruth's homespun wisdom comes through her letter to Naomi, she teaches her a valuable lesson about expressing herself in order to keep her soul tender. What Bible verse does Naomi connect with Ruth's wisdom? Question 7: Throughout Londonderry Dreaming it is lack of communication that keeps people apart. In chapter 9 Naomi learns a vital lesson to help her communication with God. What is that? Answer 7: She learns that even in her relationship with God she must speak out loud words of love and adoration. That actual saying of these sentiments helps her move closer to the Lord.